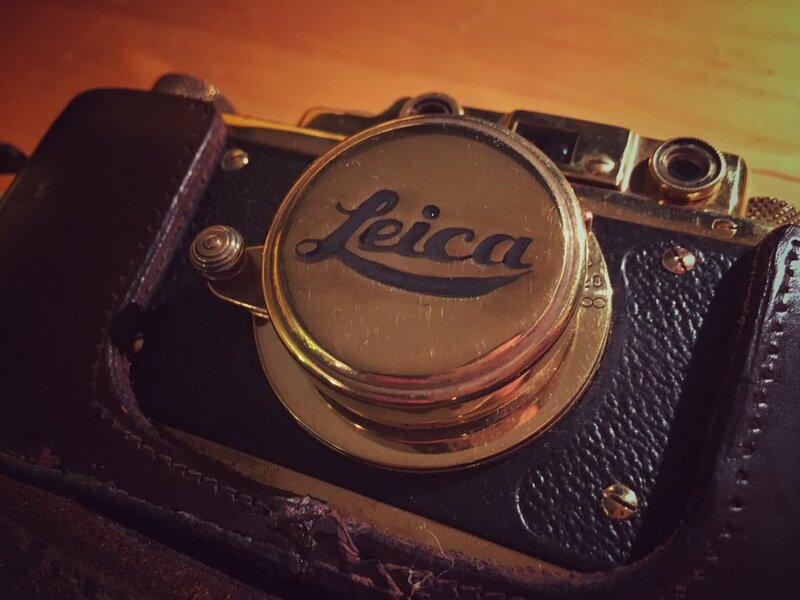 Leica, renowned for their quality and reliability, were (still are in many cases) considered to be the best cameras you could buy. Many of the best photographers in the world used Leica cameras - Carier-Bresson, Frank, Capa, Leibovitz. I have always wanted a Leica camera. They are compact, beautiful, and the optics are indisputably top notch. 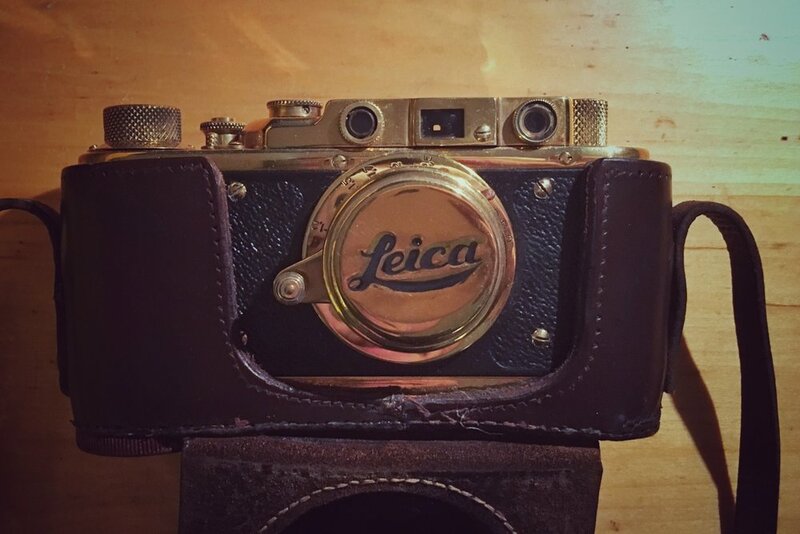 This is not a Leica camera. I collect weird cameras, generally Russian, because I enjoy odd designs, weird functions, or just silly history. Most of what I have are Russian Leica knockoff cameras. As part of reparations for WWII, Russia were (was?) given the schematics for the original Leica cameras. Over the following twenty years, the KMZ plant would churn out dozens of Leica "inspired" models ranging from total, complete rip offs to ultra-modern design. Zorki 4k, the first well designed, popular of the Soviet FED-Zorki line. The first commercially successful of their cameras, the Zorki 4K, arrived in 1955 and started the slow march away from German design. The Zorki 5 started moving to boxier designs while retaining the Leica-styled front and center logo. The Zorki 10-12, Z-10 pictured above, were the last in the line and a total departure in styling. Blocky, square, and heavy, they more closely resembled the Argus C3 Brick. All boxy and emblematic of 70s modern lines. After the cooling of relations between Russia and the US in the 80s, tourism increased. Attempting to make a quick buck, enterprising Russian entrepreneurs bought old back stock of the early Zorki lines for dirt cheap and either buffed the brass under the coated skeletons or coated them in a brassy/gold cover. They removed any markings from the original KMZ manufacturer, the Zorki logo, and any Russian indicators - like the B bulb letter - and re-engraved them with German/Leica indicators. Especially clever ones would further decorate the cameras with German iconography to sort of up the ante on rarity. The model I found is one of the better done knock offs. 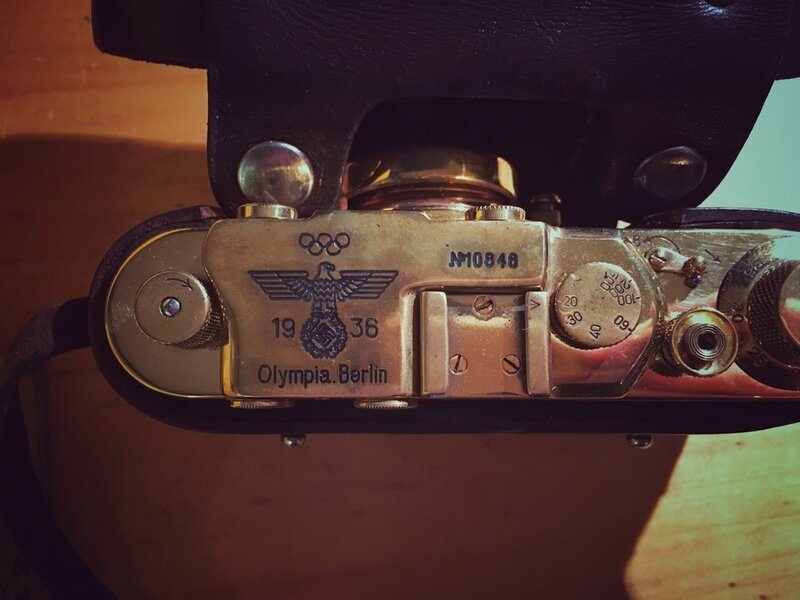 It has no Russian letters, sports the collapsed "Elmar" lens typical of Leica I and II models, and incudes a very fake serial number and German THird Reich '36 Olympiad symbol. A very well done facsimile of the 30's Leica logo. The engraving around the lens rim is pretty bad on closer inspection, much deeper than typical with very rough edges. Also, no Russian lettering. You can see where the bulb letter was buffed off on the shutter speed dial. All the words are even spelled properly! On first glance, t's pretty convincing. You know... except for being gold... But a 90s tourist otherwise unfamiliar with WWII era cameras could be swayed readily. A number of these came home with rather disappointed families when they were further investigated, especially if they paid the multiple thousands of dollars often asked for.